Now that I'm doing mainstage shows, I've been missing some Awkward Compliment shows on Thursdays. This saddens me, but at least I'm not missing them all the time! I'm glad I still get to be part of the group. Not that they'd kick me out without a fight. A chicken fight. 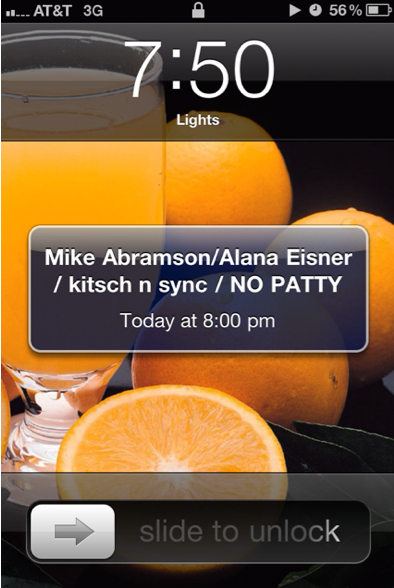 To let them know when I'm scheduled to NOT be there, I added "NO PATTY" to our shared calendar. That's what it looks like when the reminder pops up on Casey's phone. I like to give them a nice, loud and angry reminder of what CRUCIAL CAST MEMBER they're missing! Also, Casey likes oranges. Dot com.